When patients are discharged from the hospital, they often aren’t prepared for the transition to the home setting. This can result in medication errors and nonadherence, increasing the risk of readmission. Many patients can benefit from medication management, not just those getting out of the hospital. Medication nonadherence takes the lives of 125,000 Americans annually and costs the health care system nearly $300 billion a year, according to the American Heart Association (AHA). “A complete continuum of care is the key factor in a patient’s successful outcome,” said Marcus Wilson, R.Ph., CEO and co-owner of Integrity Pharmacy, an independent community pharmacy that provides comprehensive medication management services in Springfield, Mo. Integrity Pharmacy provides a complete continuum of care for patients by incorporating home nursing, the patient’s medication manager (a nurse or other caregiver,) medication synchronization, refill management and medication reconciliation into its program. Wilson said one of the main reasons a newly-discharged patient becomes a readmission statistic is because of mismanagement of prescription medications. With the health care system lacking clear communication between providers, especially regarding medications, the Integrity Pharmacy team recognized the pharmacy as the one place where a patient’s care coalesces. “We’re passionate about communicating with the other providers involved in a patient’s care to ensure we’re all operating with the most accurate knowledge about that patient’s circumstances,” Wilson said. While the pharmacy’s program, which has operated for nine years, started with patients recently-released from the hospital, it’s now designed to help any patient managing medications. For example, a home visit may benefit a patient only taking two or three medications but who has difficulty seeing or getting to the pharmacy. And, a patient taking 25 different medications can likely benefit from medication synchronization. Continuum of care services can help both of these patients. The process starts with a home visit. A registered nurse with Integrity Pharmacy visits the patient upon admission to the continuum of care program. The nurse assesses the living environment to look for social or financial barriers to medication adherence and provides medication training, to train patients on using medications such as inhalers or insulin pens. Patients’ medications will also be synchronized, so all of their medications come due for refill at the same time. The pharmacy staff regularly interacts with their patients to make sure they’re on track with the program and to address any problems that arise or that potentially could be avoided. “We stay in touch with them at a minimum of once a month, and we also send out our nurse as often as needed,” Wilson said. Initially, the nurse spends a minimum of one hour in the home, but it can take up to two to three hours, depending on the patients’ needs. Throughout the month, the staff calls each patient to discuss refills, follow-up appointments, insurance issues, medication therapy management (MTM) or comprehensive medication review (CMR) possibilities, medication outcomes and any concerns he or she may have. Integrity Pharmacy also provides a CAREpack® to each patient enrolled in the program. The CAREpack contains a complete 30-day supply of all the patient’s maintenance medications, packaged by clinical pharmacists. “Each pack is both time and date stamped and organized by the day,” Wilson said. Additionally, the pharmacy can supply pre-packed medications along with the CAREpack, such as inhalers or eye drops. The CAREpack can also include over-the-counter (OTC) items. These services don’t cost patients anything beyond the price of their prescriptions. “The majority of the patients we see in need of a service like this in our area are low income,” Wilson said. Not wanting to exclude patients due to financial barriers, the pharmacy decided to offer the program at no extra charge to patients. While it’s a slow process, people are starting to recognize Integrity Pharmacy for the continuum of care services it offers, Wilson said. “We’ve had many physicians’ groups, hospitals and accountable care organizations (ACOs) reach out to us for assistance with their patients, especially those who are about to be discharged from the hospital and those who are high risk for medication errors,” he said. And, by tracking their patients’ progress, they found that their patients have significantly lower readmission rates due to increased medication adherence and compliance. Wilson’s advice for other independent community pharmacies wanting to establish a similar program is to go slow, and recognize that it’s a process. For example, don’t try to implement medication management, medication synchronization, immunizations and education all at the same time. “Pick one and refine the process. Then, add on additional services,” he said. Integrity Pharmacy is always looking for new ways to improve patient outcomes. Currently, the pharmacy is working on incorporating pharmacogenetic testing, also known as MedTek21, into its continuum of care process. Pharmacogenetic testing provides insight into which medications will work best for patients based on their genetic makeup. According to Wilson, more than 75 percent of people have genetic variations that determine how their bodies process and use drugs, including prescription medications, OTC medicines and herbal and dietary supplements. Because of these genetic differences, two people can take the same dose of the same drug, but respond in very different ways. Even if a drug was prescribed correctly by a doctor and used correctly by the patient, it could still cause an adverse reaction as a result of that patient’s genetic makeup. And, these adverse reactions and events can damage providers’ scores on quality measures mandated by the Centers for Medicare & Medicaid Services (CMS), otherwise known as Star Ratings. Pharmacogenetic testing can improve the efficacy of a patient’s medication therapy; therefore it can boost adherence rates, reduce overall medication costs and positively influence Star Ratings, Wilson said. 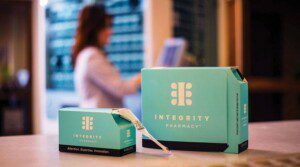 Integrity Pharmacy’s pharmacogenetics program safeguards at-risk patients by alerting caregivers of potential drug-gene reactions, indicated by the patient’s genetic variations. “The program integrates with systems to enable providers to proactively reduce adverse events, save time, improve outcomes and boost quality scores,” Wilson said. Medication nonadherence is a growing problem, resulting in poor patient outcomes and increased health care costs for individuals as well as the health care system. Here’s a look at the statistics.